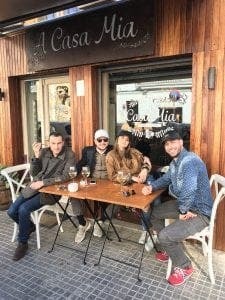 WHILE San Sebastian might have the most Michelin stars – and probably the best tapas – Santa Catalina has the biggest variety of restaurants in a small area anywhere in Spain. There are at least 100 restaurants in this trendy barrio of just over a dozen streets. But what is most remarkable about the dining scene in Santa Catalina is the number of foreign chefs. Restaurants from Vietnam and Japan, sit cheek by jowl with eateries from Peru and Mexico, while Greek chefs vie for attention next to Israelis. And, best of all, none of the restaurants I have tried over the last couple of months have disappointed. Having written about food and dining for the last two decades, much of it as a travel writer for the Daily Mail, I have come across some amazing restaurants and just as many chefs. 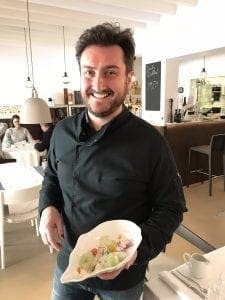 In Spain, I have interviewed and tested the food of Madrid’s three-Michelin star wunderkind David Munoz, while at Celler de can Roca I got a personal tour by Joan Roca himself. In Bilbao I interviewed creative genius Eneko Atxa at Azurmendi, while I three times grilled ‘chef of the sea’ Angel León in Cadiz. But few places have entertained me as much as the chefs in Santa Catalina, easily Mallorca’s best area to eat. One of the true characters is Benabe at Vandal. The Argentinian of Italian descent has only been open since July last year, but he is already making big ripples in the Mallorcan food stakes. He calls his cuisine ‘traveller or adventurer style’, keen to avoid the word ‘fusion’ which has become so pastiche these days. “But the truth is I’ve cooked all around the world so it really is a fusion of everything,” he tells me. 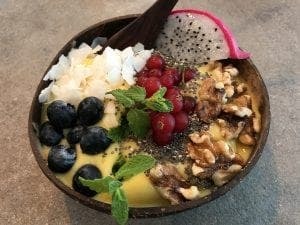 His adventure has taken in Thailand (near Chiang Mai), Japan for two stints and even the celebrated Noma, in Denmark. He still has a Japanese restaurant in Valencia, which he pops back to regularly, when not cooking at Vandal, a vanguard, industrial-style spot, fitting for the history of Santa Catalina. Unsurprisingly the food at Vandal is adventurous and original, and there is nothing standard about it from the school-report style menus to the graffitied walls. I tried loads of things, but was particularly impressed with the glazed bone marrow with beef tongue, not to mention the eels, which had a real kick coming out gelatinous and peppery. Across the road, an equally adventurous spot is Kurobota, owned by Englishman Luke Perry. Hard to pigeonhole, its manager Sergio, from Milan, sums it up as ‘a touch of Korean and Japanese, although not sushi, as well as Chinese and bits from Laos’. The food however is delicious, particularly the soft shell crab bao and miso-glazed Iberian pork, not to mention its amazing mix of cocktails, served up by genius Sergio, who has lived in Santa Catalina for over a decade and previously ran his own cocktails bar. Looking for somewhere classical, but with a creative twist on top? Head to recently-opened Taller de Mar where Ricardo, from Ancona, in Italy, is producing some of the most sumptuous dishes I have ever eaten. A friendly, softly-spoken fellow, he has a true artistic talent, learnt working for years around Germany (with Alfons Schuhbeck) and Austria (three Michelin-starred Eckhard Witzigmann). You can tell the food is going to be special from the uncluttered interior design and simple settings, and it does not disappoint with some crafty dishes including black beluga lentils and the beautifully presented prawn ‘brickstick’ which comes with zucchini, radishes, peppers, baby tomatoes and strawberries. The real winner though was the scallop ceviche with cantaloupe melon, with edible flowers and coriander, poured over with an amazing tiger milk soup. Another fabulous new addition to the local dining scene is Fulla d’ostra across the road. A genuine five-star for style, few places in Mallorca can beat the seductive lighting and beautiful interior design… this is true grand cru Malloquina. 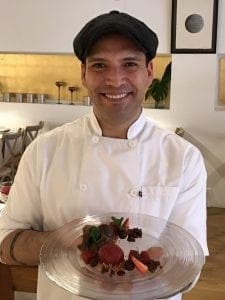 And the food luckily matches, with Chilean chef Hector Marcelo and team of Venezuelan and Senegalese, creating a wonderful melting pot of tastes. It’s a tried and tested formula, Hector having previously won plaudits with co-owners Claudio and Martha Arais in Barcelona. You must definitely try their excellent Chilean-style ceviche (‘while the Peruvians claim it as their own, it is actually an ancient Inca dish, created before Peru existed,’ insists Hector) as well as the duck breast with fennel. Best of all though were the scallops, coming out in a very generous group of four, and easily as good as any I have tried in Galicia. 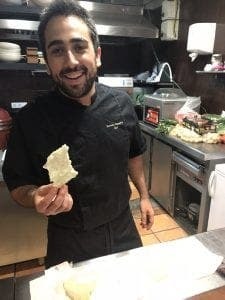 On the subject of creativity, a MUST-VISIT is Naan Street Food, where Argentinian Nicolas ‘Nico’ Malenchini has created one of most popular places to eat in Palma. Regularly topping the TripAdvisor rankings for the area, it has an excellent mix of international flavours, from Vietnamese to American, and Peruvian to Japanese. Presentation is unfussy and the vibe is loud and buzzy, so expect the place to be full most days of the week. Top picks include the amazing fish tacos (I ordered them again, they were so good), while the pastel de camerones had a great mix of flavours. For originality, it’s hard to beat Simply Delicious, which you would be hard pressed to challenge with the Trade Descriptions Act. It is exactly what it says on the tin, simply delicious, although with a bent very much leaning towards healthy food. 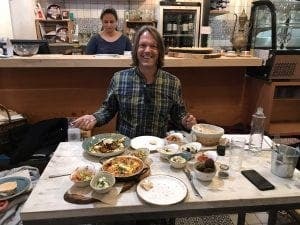 The creation of livewire Israeli Ronen Levy, who lived in Sweden for two decades, it is mostly vegetarian, but certainly not all, and I have rarely eaten such good Middle Eastern fare. 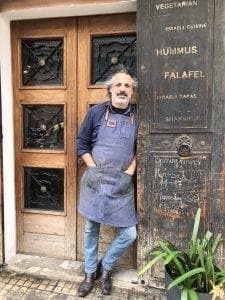 “Most of our clients are vegan and women, so I’m catering for them, but I also like to serve up a little meat,” he explains. This included an amazing dish of organic lamb with hummus, as well as a homemade beef invention, that takes some beating. It was however, by a babaganoush, no less, which has genuinely changed my view of the dish, rich and creamy and even dreamed of since. 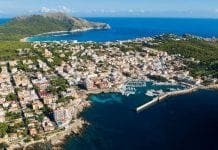 When it comes to Italian restaurants, you are spoilt for choice in Santa Catalina – and I probably met at least half a dozen Italian chefs plying their trade here. For the most classical style you can’t go wrong with ProSecCo which has a fantastic terrace, busy for most of the year and a friendly owner Luca Veronesi, who has a good eye for quality ingredients. Expect to eat plenty of fresh pasta, fantastic pizzas and the best tiramisu in Palma. There is also an excellent-value menu del dia at just 12.50 euros, which has a choice of three starters and five main courses. The wine list is good too. In total contrast look out for A Casa Mia, a true family affair, set up in 2013 out of ‘love and passion’ for dining, with a nice mix of Italian and Mallorquin food. Run by three brothers and with mum Fabrizia in the kitchen, you will rarely find such a friendly, homely place. With a massive attention to detail, the food is bought every day at the local market and could be anything from mussels to oysters, but is most likely to include some fabulous filled raviolis and splendid fresh salads. A Vitello Tonnato of sliced veal with creamy tuna mayonnaise and capers was splendid, while the La Parmigiana (aubergines with tomato sauce and buffalo mozzarella) was delicious. The wine list is second to none, with some of the true Italian classics, as well as plenty of wines by the glass. And let’s not forget the Mallorquins, with local character Toni Ripoll running his fabulous Tartaro with true aplomb. Now open for four years, having run another restaurant Paladar for 20 years nearby, Toni has created one of the most warm and sumptuous joints in Palma. Bustling on most lunchtimes, this is very much the place for businessmen to schmooze their clients and families to come out for a special occasion. And Toni knows them all, the great and the good from the city, sharing a glass of wine with them or a cigarette on the terrace outside. Foodwise you have a choice of ‘tostas’ which come with such delights as foie and fig and brie and aubergine, but you really have to try the tartares, which are his signature dishes. There are eight of them and apart from the traditional beef and salmon tartare, there are some original ones, such as chicken and prawn and artichoke. Up closer to the market look out for Santina, which is one of the hippest spots to hang out in Santa Catalina. This beautiful corner restaurant is the creation of pretty German Madeleine and Dutch restaurateur boyfriend Vincent, who has a trio of restaurants in Barcelona. Their catchphrase is ‘we love to make food for the city that loves to eat it’ and they have an almost uncanny idea how to create tasty dishes. There is a splendid mix of healthy dishes (many gluten-free, such as organic quinoa burgers) as well as bagels, wraps and big fruit bowls. I had a fabulous chicken sandwich with rocket in sourdough bread, which ticked the box perfectly for a light working lunch. Nearby, for light bites you must also check out Claro, which is another hip spot opposite the market. It describes itself as a ‘concept food store’ and has a nice range of Italian fast food dishes as well as great breakfasts and light lunches, plus superb fresh juices. Another excellent lunch and breakfast spot is Moments, which sits in Placa del Pont, a new area getting hipper by the day. Inside it is attractive with cool photos on the wall, while outside there is a great terrace. As well as light dishes, it does an excellent coffee and there is a decent selection of wines by the glass too. Back on an international note, an interesting spot to look out for is Solee, which has an interesting mix of Spanish and Bosnian food, with a touch of Austrian too. With an excellent terrace it is a great place to while away a sunny lunchtime or evening, particularly as there are some great cocktails. 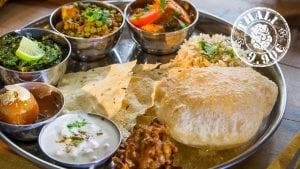 Bindi is an excellent Indian fusion spot, popular and usually busy most nights. 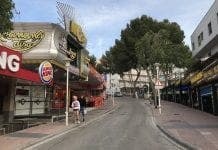 It was set up by bubbly Bin, who grew up in London and came into catering after a degree in chemistry and a career working as a management consultant much of it in Ibiza. Seductive in style and lighting, the food is a mix of traditional and creative, and changes regularly by the season. Another true stalwart for the area is Duke, run by Ronny, from Greece, a pensive chap, who runs a tight ship, providing meals for up to 50 people at a time. Describing his food as ‘world cuisine tapas’, there are dishes from all around the world, and the place is a truly charming spot to eat. I loved his trio of ceviches, not to mention his excellent broccoli falafels, healthy stuff, with a nice spicy kick.